What a day!! 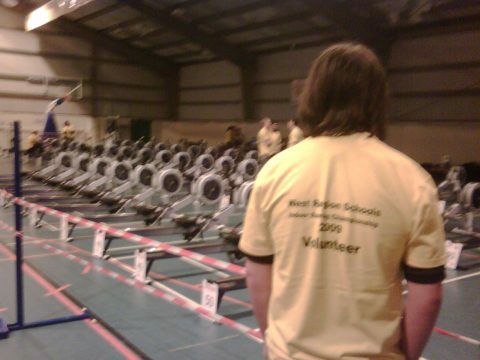 On Wednesday March 4th, Ali Johns and myself attended the Regional Schools Indoor rowing Championships held at Marjon University, Plymouth. There were roughly 150-200 students competing in different age groups starting from year 7 right through to year 13! 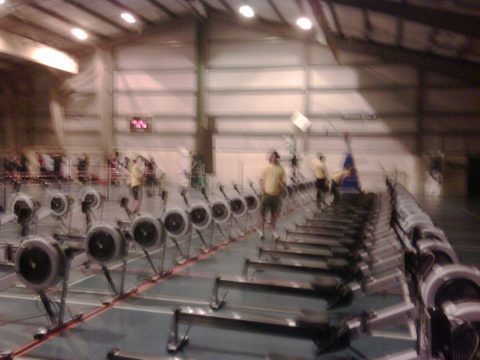 There were 50 concept 2 rowing machines connected to a central computer recording all the times and distances. There was also a big projector showing were they were in the race, so competitors could see how far ahead or behind they were. FMPGC were represented by the Owen twins, Bethan and Rosie. They both done a fantastic job with Rosie finishing 3rd and Bethan close behind in 7th place in their category, Yr11 girls. Hopefully with these placing they should both go through to the national’s in a couple of weeks. These results were even more brilliant when we found out that neither of the twins have had any coaching! We are now hoping that they can receive some coaching from our newly qualified dry instructors. Good to luck to the both of them in the future. A number of FMPGC junior members are taking part and Ali and Danny are helping in the organisation of the WRSIRC event. 4:41pm – Year11 girls – FMPGC’s Rosie 3rd, Beth 7th from all of Devon and Cornwall. 3:32pm – Year12/13 – 2000m winning time just in – 6:12 ! 1:48pm – Set up is nearly done as the slightly soft-focus image below of ergo-heaven shows!